Support the creation and marketing of a Pastured Poultry Differentiation video series. The marketplace is full of claims, certifications, and labels. Walk down the grocer's aisle, and you'll see certified organic, antibiotic free, cage free, free range, natural, Omega-3 added, and so much more. Often the products behind the marketing claims are nowhere near a movement-based pastured poultry model. As we come together in 2019, the marketplace is saturated with claims and deliberately confused. That's a fundamental problem. The market confusion prevents consumers from purchasing the difference they seek. When a consumer shops for poultry and eggs in terms of high animal welfare, environmental stewardship, nutrient density, and strong local economies, they picture pastured poultry. Conventional chicken companies have caught on to the consumer demand for something different and better. They have shifted their approach to capitalize on the market. However, they don't adopt the same principled approach as you. Instead, they fight to water those principles down as much as possible through third-party certifications and label definitions that earn them their premiums. The integrated poultry companies disparage the decentralized, independent pastured poultry farms while still seeking to capture the market premium you’ve helped to create. They’re making incremental changes in return for a maximum profit while spreading fear, uncertainty, and doubt about you. You and the rest of the pastured poultry community are left competing with the marketing budgets of a multi-billion-dollar industry. We are asking you to make a marketing and advertising purchase, and will add your contribution of $100, $250, $500 or more to all the other contributions we receive. When we combine the community's contribution into one resource that will fund the project. This is not a donation. This is marketing and you will receive a benefit. The video series will continue the work started with the Better Way Forward by creating these additional 3 to 4 minute videos. We're asking you to support the project with a meaningful contribution, knowing that whatever you contribute will be amplified through the collective contributions of your community. You will receive four tangible marketing videos to help you educate customers and promote your farming model, receive a credit in the video of choice, and fund lead-generation marketing for your farm. Every contribution, in any amount, helps spread the positive message of pastured poultry, and your input will be amplified by the entire community's giving. Where else in your marketing will you be able to spend $250 to create $20,000 worth of recurring consumer-focused branding, lead generation, and consumer education? You can contribute to the pastured poultry video project by completing the form below. Send a check with your contribution to PO Box 85, Hughesville, PA 17737. Select which video you wish to direct your funds to. In which video do you want your credit to appear? 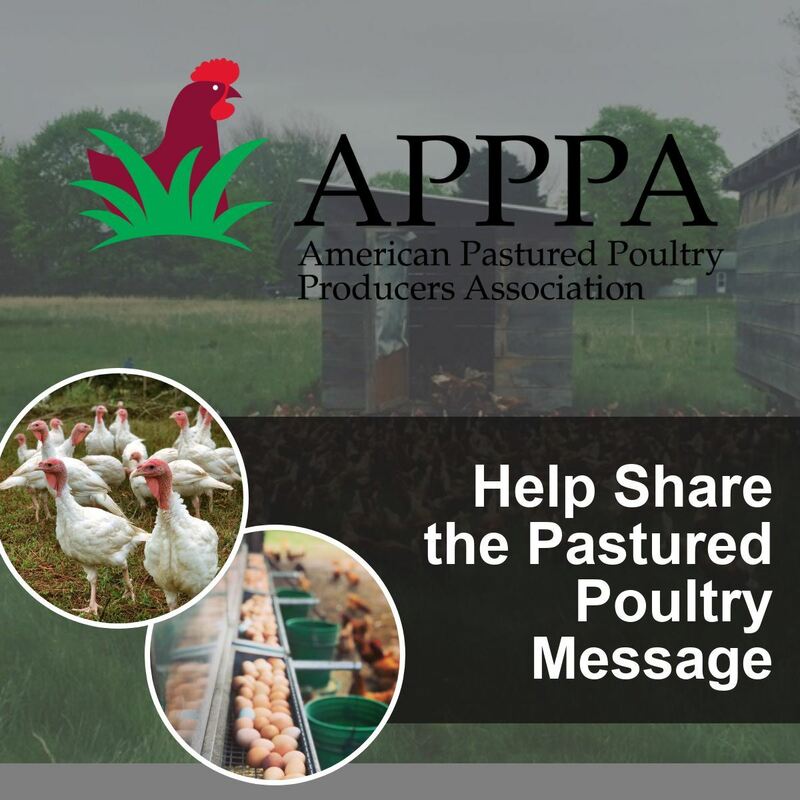 APPPA's first consumer-focused pastured poultry video was release in November 2017. The 2019 videos will build off this successful message. In order to fund the filming, editing, project management, publication, consumer education, and initial marketing for four videos, our initial goal is $20,000. If we exceed our goal, APPPA will invest the funds into additional promotion and marketing, educational outreach for consumers and producers, research sponsorship, and other needs as directed by the board.